The Comprehensive Africa Agriculture Development Programme (CAADP) provides an agriculture-led integrated framework of development priorities aimed at reducing poverty and increasing food security by achieving an average of 6 percent agricultural growth rate every year. Initial economic modeling results to support CAADP planning indicate that, while it is possible for many African countries to reach this target, it will require substantial additional growth across different agricultural sub-sectors and commodities, as well as substantial investments to stimulate the necessary acceleration in growth. In many cases, the agricultural investments required are in excess of the 10 percent of total expenditures commitment agreed on under the Maputo declaration. 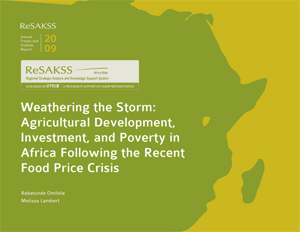 This is necessary because of the moderate and slowly growing agricultural productivity across the continent. As countries enter the operational stage of CAADP investment program design and execution, mostly starting in 2011, a fundamental policy research question is how to raise and maintain high agricultural productivity across different parts of the continent, particularly technical change, given the limits to factor substitution. This 2011 annual trends and outlook report (ATOR) addresses the gap by analyzing the inter-temporal trends and spatial patterns in partial and total factor productivity, to help identify options for raising and sustaining high agricultural productivity across different parts of the continent.